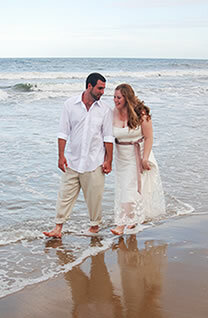 On location portraits: By far, the most frequent requests I receive are for family portraits on the beach. What a great way to commemorate a vacation, reunion or other special occasion! My favorite beach portrait locations are First Landing State Park and Little Island Park. Both parks offer clean beaches, sand dunes and wooden boardwalks for a variety of settings. From single subject head shots to extended family groups, I love meeting new people and bringing out that inner spark that lights up a photo. Special events coverage: Planning a small outdoor wedding? Invite me! Memorialize birthday parties, fundraisers, company picnics, or any other group event. Hourly rates vary depending on the type and length of the event. Journalism and marketing: I am available for single or long-term freelance assignments to cover articles in your publication. I can also help with marketing images and copy. Call me to negotiate hourly or per image rates. My Nikon DSLR camera produces exceptional quality high resolution images. You will receive your images and a rights release via your choice of download or CD/DVD. Digital files give you the flexibility to print, publish, and email your pictures without paying extra fees to the photographer. I can be contacted via email dawn@awestruckphotos.com or telephone (757) 214-3112 to discuss your freelance photography needs. Oh, yeah, and don’t forget to “like” us on facebook!